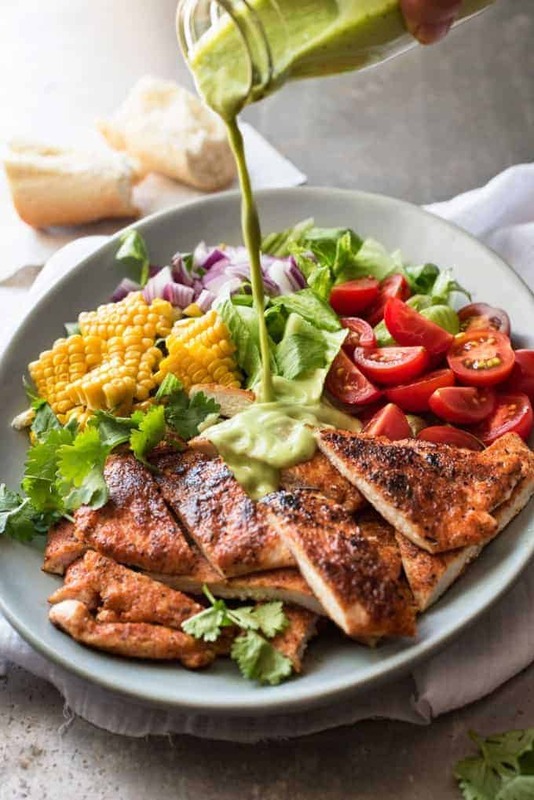 This Chicken Salad with Avocado Dressing is made with a seasoned, juicy chicken with a colourful salad, and tossed with an awesome creamy avocado dressing that tastes just like guacamole. 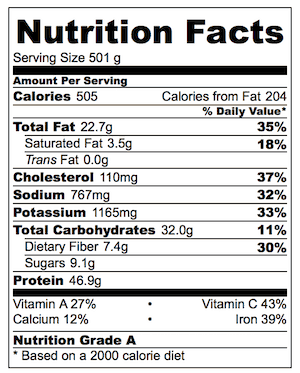 Avocados are cholesterol free and full of nutrition – we need to get MORE in our diet! Gasp, shock horror, I’m finally posting a salad! Long overdue….so much for my New Years’ resolution to post more green things here on RecipeTin Eats. ? Can I be honest? I’ve actually made and photographed a handful of salads….salads with oomph, not wimpy ones. I mean salads that are healthy but still truly satisfying to have as meals. I write up the recipe and even schedule it to publish….then I get distracted by something I’m even more excited about. Like that Baked Chinese Sesame Chicken I shared a couple of weeks ago. I actually had the slot reserved for a Buffalo Chicken Salad, but it got bumped at the last minute because I made the Sesame Chicken the day before and I got overly excited about it. Oops. So much for a professional editorial calendar. I could never run a proper magazine. Can you imagine?? Changing my mind at the last minute like that! But today I’m sticking to my guns because Chicken Salad with Avocado Dressing is seriously worthy of having as meal. 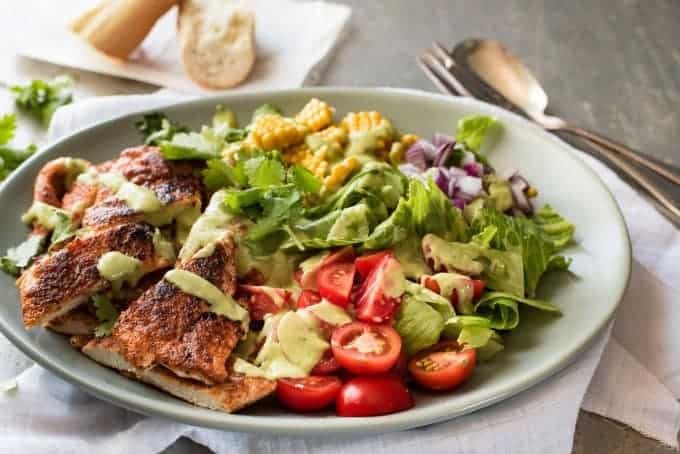 And it all comes down to this – the creamy avocado dressing.? Beautiful ripe avocado and a handful of other ingredients to make a luscious avocado dressing that actually tastes like avocado. In response to which, I instantly stuck my finger in for a taste, ready to argue….and realised….it didn’t. At least, not enough like avocado. 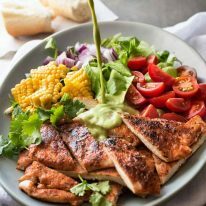 I make this salad with a tasty chicken which is seasoned for extra flavour. I really think it is worth making a basic spice rub to flavour chicken for salads. Makes salads extra interesting! I promise to share more healthy, lower calorie meals in 2016. My recipes aren’t typically cream / butter heavy unless it’s for a special treat. But I have a whole repertoire of lower calorie, more nutrition dense recipes. I am seriously thinking about increasing my weekly recipe posts from 3 to 4, and making the extra recipe a healthy one. What do you think? Do you want to see more healthy recipes here on RecipeTin Eats? PS That’s healthy…..without compromise! I can’t compromise flavour for calories…I just can’t. It’s not in my DNA!!! A scrumptious, healthy salad that's satisfying enough to have as a meal. 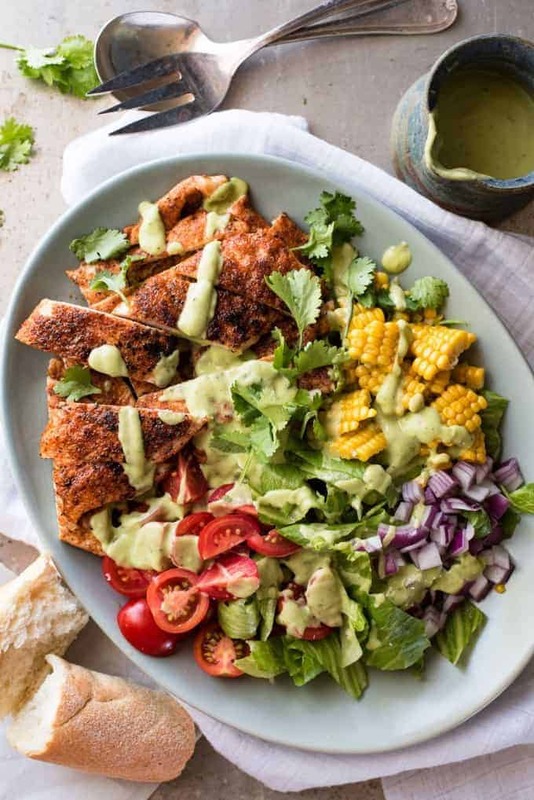 The star of this is the creamy avocado dressing - full of nutrients, flavour and so delicious! Spice Rub: Combine ingredients and scatter on a plate. Chicken: Slice into 4 - 5 thin steaks on the diagonal, then coat both sides with Spice Rub. 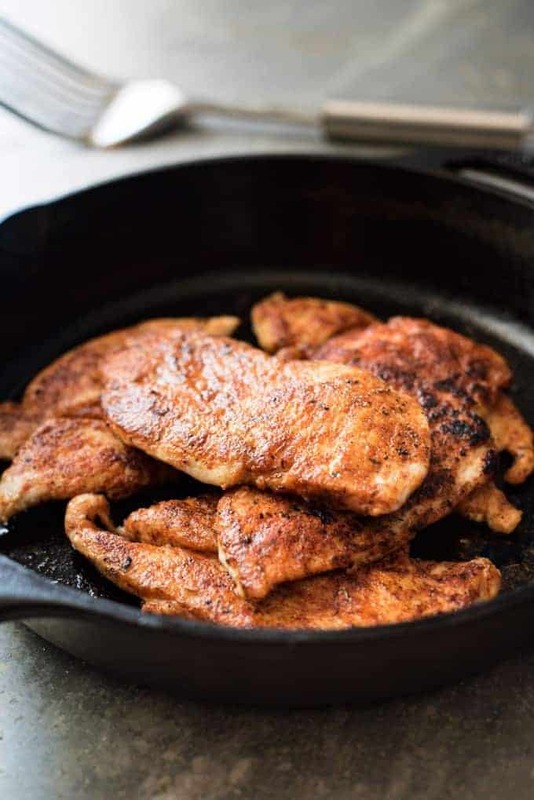 Cook Chicken: Heat oil in a large skillet over high heat. Add chicken and cook both sides until dark brown. Remove onto a plate and cover loosely with foil. Rest for 5 minutes then slice thickly. Pile the Salad ingredients onto a serving platter then place the chicken on the side. 1. I like to puree it a lot so the cilantro/coriander becomes pureed into the dressing because it adds to the green colour of the dressing. But you could puree it less so you have more specks of green in the dressing. It doesn't affect the flavour, it's just aesthetics! 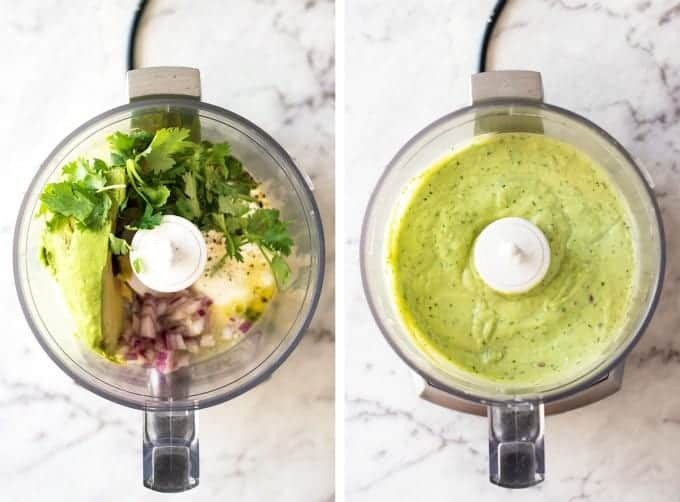 This makes more dressing than you will need. It's hard to make less. The leftovers are fantastic to use as a sauce for other proteins, use as a dip or to spread on toast! It thickens when you refrigerate it. Is it 1 whole garlic? Your recipes are by far that anyone posts out here. I cannot say enough about how amazing they are. When I see one come to my e-mail I immediately go to as I know it will be spectacular. Thank you so much. Your a chef extroidinaire!! Hi, I absolutely can’t stand cilantro (coriander). Will this recipe be okay without it or should I substitute something else in its place. This,is a really really nice avocado dressing. I using it in future on top of a turkey Cobb salad as well as your chicken recipe here I am making tonight for first time. Wow! This was delicious beyond my expectations. Even further beyond the expectations of my fussy family. The avocado dressing was to die for! The chicken was amazing. My husband asked me to put it on the ‘regular rotation menu’ which, by the way, consists mainly of your recipes Nagi. I’m sorry I haven’t reviewed for a while, but let me tell you that around 90% of our meals are RTE meals these days. WOW!!! This looks like something I could eat every single day! Great photos of all your creations too!!!! !